Gluten Free Pumpkin Muffins are soft, sweet, and made with just the right amount of pumpkin spice. 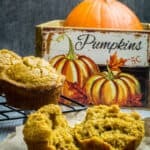 These gluten free muffins are so easy to prepare and use real pumpkin puree to give them an honestly authentic flavor. Top with cream cheese, butter, or even a drizzle of maple syrup for a treat your whole family will love! I love muffins. Most of all these gluten free pumpkin muffins. 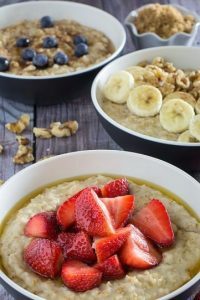 They’re the perfect grab-and-go breakfast in the morning, and even better when you have a chance to sit down and really enjoy them with some cream cheese and a cup of coffee. Don’t even get me started on pairing these with coffee. They’re Bonnie and Clyde. Mickey and Minnie. Sunny and Cher. R2D2 and C3PO. They just belong together. I even freeze these gluten free pumpkin muffins in batches, so I can pull them out of the freezer and pop them in the microwave when I get to work. 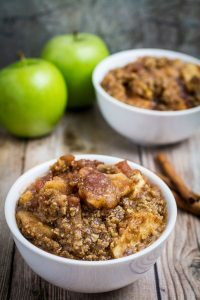 Convenience can be hard to come by in the gluten free world, and that’s what I’m all about with this recipe. So, how long has it been since you’ve had a really good gluten free muffin? I mean, really good? Like, I-refuse-to-share-these-with-anyone kind of good? If the answer is “not for a while”, then you’re in luck. 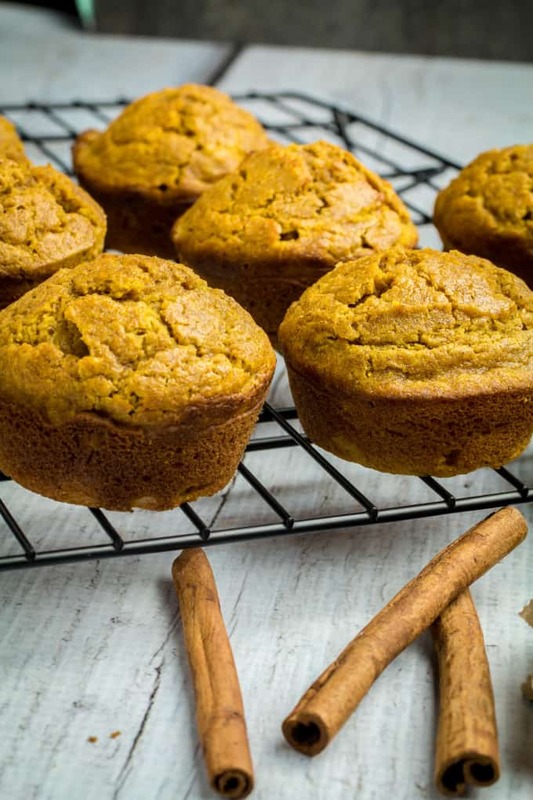 These gluten free pumpkin muffins are that good. I’m talking downright delicious. They’re sweet. They’re pumpkin, with pumpkin spices. They’re the fluffiest of fluffy. Serve them warm and prepare to be delighted. I haven’t swooned over a baked good like this since the day of the Gluten Free Pumpkin Oatmeal Cookies. Increase the cooking time by about 5-10 minutes. Keep an eye on them to make sure they don’t over cook. That’s what I would do, if I were making these bigger. 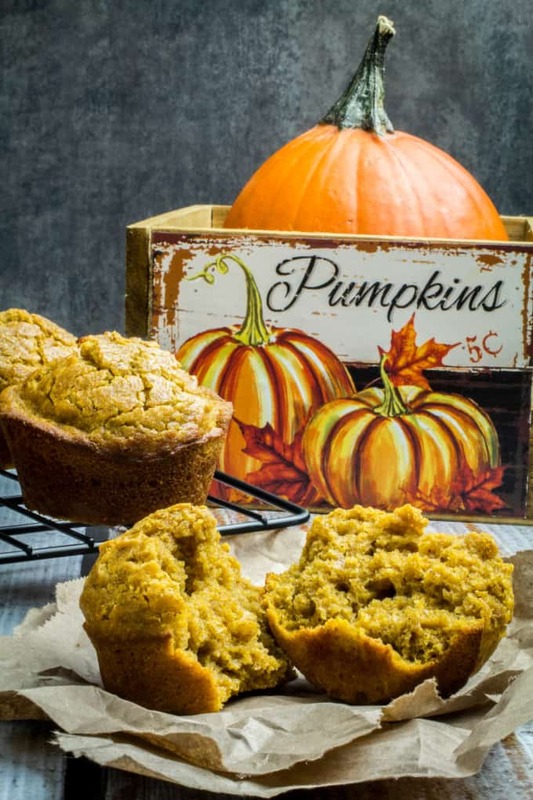 You can add a few things to these gluten free pumpkin muffins if you really want to. I suggest 1/2 cup chocolate chips/butterscotch chips, or 1/2 cup raisins. I prefer to eat these with a bit of cream cheese, but you can also add butter or drizzle them with some maple syrup. However, you could even eat these plain, they’re that good. Ok, let’s take a second to talk about gluten free baking. 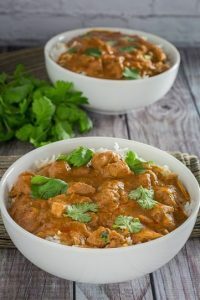 There’s a few things you need here to make these turn out REALLY good, and if you switch the recipe around, you may be missing out on some key elements. The first thing in the light cream. Normally, a recipe will call for milk. 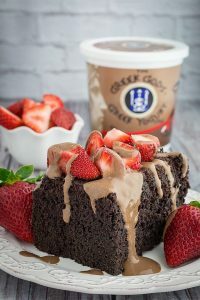 When you’re using gluten free flour, you want to use cream instead of milk, because cream has more naturally occurring acid in it. This affects the rise of the muffin, and also creates the muffin top we all know and love. In addition, you want to keep the spices a bit higher than in non-GF baking. It’s all about flavor. Another good tip is butter. You also need the butter. I know you can technically replace it with applesauce, or whatever, but gluten free foods already have a problem with being crumbly and dry. The fat from the butter will help keep these pumpkin muffins together, in addition to tasting good. I promise! Finally, the baking powder. It’s another key element for the rise of the muffin tops, however, you need to make sure yours says “Double Acting” on the packaging. If it doesn’t, then you should start mentally preparing yourself for the horror that is flat muffins. It’s important that we just look towards the future now. The big, perfectly risen muffin-top future. Gluten free muffin top future, that is. 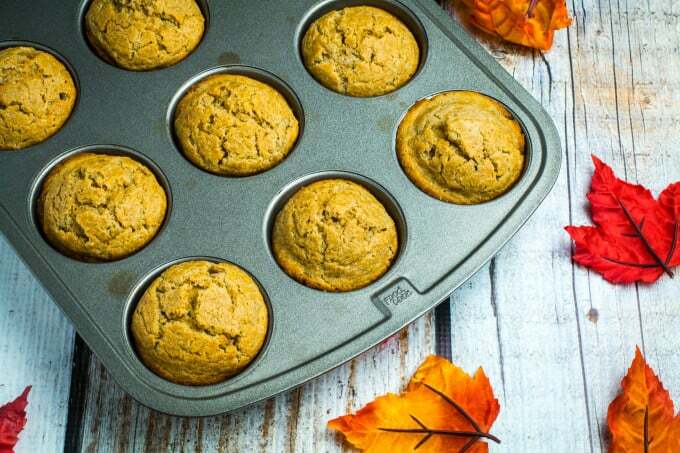 Soft, sweet, and made with just the right amount of pumpkin spice, Gluten Free Pumpkin Muffins are perfect on a chilly fall morning. 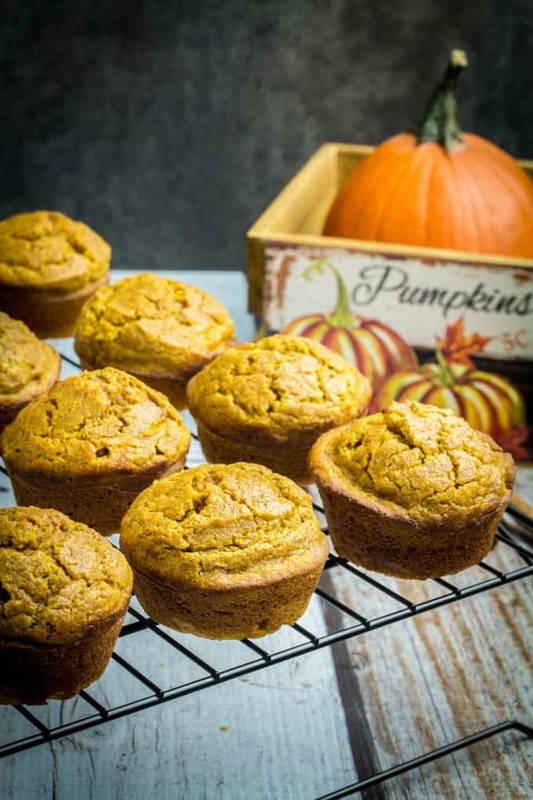 These gluten free muffins are so easy to prepare and use real pumpkin puree to give them an honestly authentic flavor. Top with cream cheese, butter, or even a drizzle of maple syrup for a treat your whole family will love! Preheat oven to 400°F. Grease a muffin pan and set aside. Combine dry ingredients in a mixing bowl (flour, brown sugar, baking powder, pumpkin pie spice, cinnamon, nutmeg, salt). In a separate bowl beat eggs, then add to dry ingredients. Add cream, butter, and pumpkin puree to dry ingredients. Stir all ingredients together (or use an electric beater or stand mixer) until well combined. Add muffin batter to greased muffin tin evenly among 9 of the cups. (You can spread them among 12, but the muffins will be slightly smaller). Bake for 20-25 minutes, or until muffins are golden brown and slightly firm to the touch. Click on the time in the instructions to start a kitchen timer! You can add 1/2 cup of chocolate chips, butterscotch chips, or raisins to this recipe if you'd like! Hi Jeanette, thanks for stopping by! I’ve tried a few different ways to replace eggs in my muffin recipes. Personally, I like using corn starch, but I know others who prefer the flax seed method. Here’s a list of ways to substitute eggs (http://chefinyou.com/egg-substitutes-cooking/). HUGE hit at my neighbor & friends coffee yesterday morning! I had sugar pie pumpkins and used fresh pumpkin puree also added vanilla and walnuts. Pairing cream cheese made them even more yummy! Thanks! i only have heavy cream on hand. Would that work? If you make 9 muffins, it’s 190 calories per muffin. I can smell that cinnamon from way over here! Now i’m craving pumpkin muffins! Absolutely delicious! I used Bob’s Red Mill 1-1 Baking Flour and reduced the sugar to 1/2 C. (I just used organic cane.) You couldn’t tell they were gluten free. I shared your link with my friends! Oh my… These look heavenly. Making these this weekend. Happy Fall! I don’t have light cream only unsweetened coconut milk. Can I use that? If so how much? These were great right out of the oven, but on day 2…not so great. Like most gluten-free recipes I’ve tried, they quickly turned to from moist and gooey to dry and crumbly. Any ideas why this happens and ways to avoid it? I can’t eat 9 muffins in one day. I would love to keep them for a few days. (I sealed them in an air tight container and placed them in the refrigerator as soon as they cooled). Hi Stacie, I usually don’t have this problem. Can you tell me what flour brand you’re using? I usually use Bob’s Red Mill Gluten Free All Purpose flour. The blend of flour types can make all the difference sometimes. Also, to salvage the muffins you have, I would try microwaving them for about a minute or toasting them right before eating. This usually helps bring some of the softness back for some gluten free products. Thanks for your response Jacqui, and so quick! I used Trader Joe’s (Baker Josef’s) Gluten Free All Purpose flour. It’s a combo of: whole grain brown rice flour, potato starch, rice flour, and tapioca flour. I do pop the muffins in my toaster oven (I don’t microwave food), but softness is not the issue. It’s the dry and crumbliness that is dissatisfying. I will definitely try different brands. I am new at this and so I don’t know the nuances of the different gluten-free flour blends. I’ve always been a fan of King Arthur as well as Bob’s Red Mill. Thanks again! Hiya…i am gonna try but with the addition of Apple butter. I’ll start with abt a 1/4 c. Apparantly the pectin makes it keep gf items moist longer…..let the expiramenting begin! That sounds like a great idea, let me know how they turn out, I’ll have to try it! Hi there! Can you use coconut flour or will it not be the same? Coconut flour is tricky to work with. You’ll have to use about 1/3 cup coconut flour for each cup of flour in a recipe. Also, add more liquid to the recipe as needed until your batter looks right. 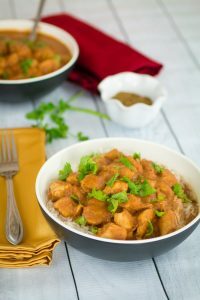 Here’s a link that describes subbing coconut flour into recipes that’s really helpful. What modifications would you make if you used gluten free almond flour? These are seriously the best gf muffins I have had! Hi, Jacqui! Something’s wrong. I can see your description and photos, and all of the rave reviews, making me crazy to try your lovely muffins… But where the recipe should appear is just a template with spaces marked for the ingredients, instructions, etc. but no recipe!! 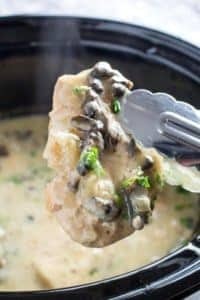 Please help me find the recipe! I am using an iPad without any special app or anything. Do I need to log in to your site to get the recipe? Thanks, by the way, for the tips explaining why certain ingredients will bring better results than others in this adventure that is gluten free baking. Doh, there it is! The recipe appeared in the time that I took typing my question. Wow, you’re good. Now, let me get baking…. HI Jacqui. Thanks for an amazing recipe. I didn’t have light cream so used the low far milk I had and added approx 1/2 tsp of apple cider vinegar for the acidity…thanks for explaining why you used the light cream…that helped me find a successful sub. I used the TJs gf flour. I only had 1/2 cup sugar and supplemented it with maple syrup. The batter seemed running but baked up beautifully. Also used Earth Balance instead of butter. You’ve made my husband vary happy! We’ll be making more and freezing them. Thanks again! I’ve made these quite a few times now, and they are always very good! Thanks for the recipe. These muffins turned out wonderful! I followed your recipe exactly. You just made my little gluten free boy very happy! Thank you so much for this great recipe. Since recently (forcibly) becoming gluten free I’ve been searching for easy and delicious baked good recipes! These muffins are in the oven right now and smell DIVINE!!! I cannot wait to eat them!! I ended up using half and half since the lady helping me at the grocery store didn’t know what light cream was, but I’m sure it will be fine! THANK YOU for putting this recipe into the world!!! Light and fluffy, this recipe is the best! Thanks. I used half and half and topped with almonds. No one knew it was gluten free. Hi- do I have to use the all purpose GF flour, can I use GF white rice flour? Also, can I use this recipe for Pumpkin bread? I would recommend using the gluten free all purpose. The reason is because it’s a blend of flours, and with gluten free baking you really need that protein/starch ratio to be just right to get a good texture. That being said, you could technically use just white rice flour, but it would probably be crumbly. I have a stupid question. I have whipping cream on hand. Is that the same cream you use? I want to make these over weekend for a fall party we are having! Thank you. Hi Rachel, yes you should be able to use whipping cream with no issues. After my son was diagnosed with celiac we’ve needed to take the house gluten free. Baking used to be my happy place, now it is all frustration and wasted food. Yours is not the only recipe I have had trouble with, but I cooked the muffins for 40 minutes (after 15 I had to tent with foil, because the tops were burning), yet even when I took them out at 40 minutes I could tell they were still not baked all the way through, but removed them because I was afraid of overcooking the tops too much, which were browning and crisping up even under the foil). We are able to eat them hot, but after they cool they turn to a gummy, disgusting ball of dough. Also, the muffins were high and fluffy looking and collapsed in after a few minutes out of the oven. Any thoughts? 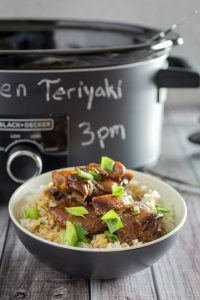 Would a lower temp and longer cooking time be a better option? I made these with Namaste Flour, any experience with this one? I know they are all different. Thanks for any advice. Hi Amy, sorry this happened! I have a few thoughts. The first is to get an oven thermometer, and measure your oven temperature. It’s a really common problem with ovens to cook too hot or too cold. The muffins rising and dropping like that sometimes can be a heat issue. My next thought is the flour blend. I’ve never tried namaste, I usually use Bob’s Red Mill GF All Purpose (red label). I’ve made them many times with that one and haven’t had an issue. Different gluten free flours have different levels of protein to starch, so baking can be tricky! They also have a 1-to-1 GF flour that’s pretty good. Let me know if you changed anything else in the recipe, and I can help you troubleshoot further! Delicious muffins!!! I had exactly 1 cup of fresh pumpkin puree and needed a quick recipe for a sick friend. Made 6 small and 6 medium muffins. Wow, I am so impressed. I just made them and they are fluffy and delicious. I used chickpea flour so they’re a little dense, buuuut that’s chickpea flour for you. Very happy I found this recipe! My son was just diagnosed with celiac. His first reply was” I’ll never get to eat you pumpkin muffins again mom!” I can’t wait to surprise him with these tonight. I’m open to suggestions of any kind about keeping a gf house. It’s all new to us! I always struggle with gluten free baking but these muffins look so good that I can’t wait to try them! Just made these this morning and now they are my new favorites! Does your flour blend contain xanthan gum? If not how much should be added, thanks! These muffins turned out perfectly and were delicious. It should work, you might want to add a splash of lemon juice to the cashew milk to give it some acidity. Let me know how it goes! These came out of the oven looking like regular muffins, so I was really excited, but they have more of a chewy texture to them which I don’t like (however my husband loves that so he loved these muffins). I’m just wondering if these are supposed to be chewy in texture? 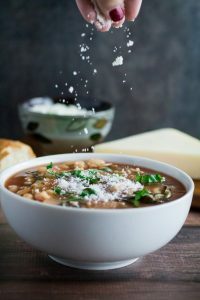 I am also dairy free so I used vegan butter and soy milk instead of what was listed on the recipe – could this be the cause? Other then the dairy-free changes I followed the recipe exactly. This is the first time I have ever made GF/DF muffins so maybe this is normal? I’m fairly new to being GF/DF. I only have measure to measure KA gluten flour. Will that work in these pumpkin muffins or do I have to get KA gluten free all purpose flour? 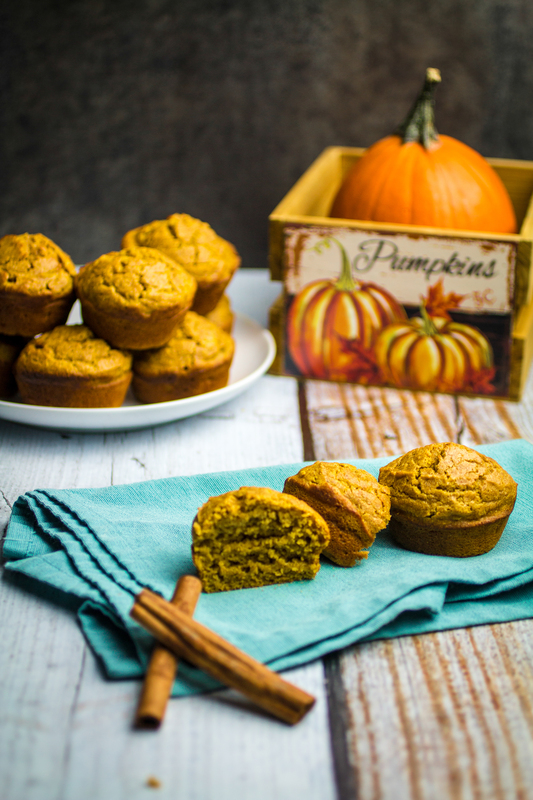 These muffins are so soft and tender with just the perfect amount of pumpkin. I love that these are GF too! My whole family loves these! I chose to add chocolate chips. I’ll definitely keep this recipe on hand in the future! Thank you so much! Chocolate chips are a great idea! Thank you! I just made these for the first time,I used some butternut squash that I had processed fresh. I always try to cut back on refined sugars for us. So I used only a quarter cup of brown sugar and the rest was coconut sugar. I also added English walnuts to give us the benefit of a nut. These were wonderful and looked just like your picture. My husband just raved about these, so this is definitely a keeper! Thank you so much about the hints on the cream and butter, I believe it made a huge difference in the texture too! I’m so glad you and your husband liked them! Thank you for the stars, the walnuts are a great tip!